The count is now up to 17 for people that have gotten sick in MA from the salmonella tainted tomatoes. I think most restaurants are pretty careful about it now. The ABP that I go to every day for lunch just started serving tomatoes again after a week long hiatus - they have a sign up that says they're getting their tomatoes from an FDA approved source. But, it would probably still behoove you to watch your tomato intake for the time being. Public health officials say the number of salmonella cases in Massachusetts has risen to 17 after five more people were infected as authorities struggle to curb a nationwide outbreak associated with certain types of raw tomatoes. There were five victims from Middlesex County, four each from Suffolk and Norfolk counties as well as one each from Plymouth and Worcester counties. I haven't been following this story too closely so maybe someone out there can answer the question. This just pertains to raw tomatoes, right? Can I still eat my marinara in the North End? I'm assuming that cooking the tomatoes should kill the salmonella. PS. I'm sure the joke has already been made somewhere, but do ya'll remember the old school "Attack of the Killer Tomatoes" movies? Hehe. Click (here) to read the latest article. 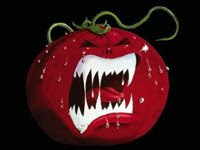 2 Response to "Salmonella Tainted Tomatoes in MA"
Eh. I think this is much ado about nothing. If you consider how many people have eaten tomatoes, and how few have gotten sick (around 200 total) and how few have died (in arguably 1 case an individual's death was in part due to salmonella, and 0 directly from salmonella), then you're much more likely dying on the way to work (120 people die in car crashes per day) than you are to even get sick. People are more scared of things they feel they "have no control over" (like scary tomatoes or mad cow disease or evil terrorists) than they are about things that they "can control" but are more likely to kill them. And if you cook them, you're fine (although the salmonella could conceivably spread to your counters and to other, non cooked food). And if the sauce is from a can, that's fine too. But really, regardless, you'd probably be fine if you only ate raw tomatoes tree meals a day. Even washed tomato should be fine.